I’m basically a stressed, uptight guy. It is very seldom that I feel relaxed and completely at ease. I don’t know why I am this way; it just seems my nature is to be anxious and stressed all the time. But, the bright side is….the weekend I spent on Tybee Island with the Tybee Church gave me a glimpse into true relaxation. My friend, Dedra, and I had been strolling the beach on my first afternoon on the island and had sat down on the south beach in front of the house where “The Last Song” was filmed. In fact, we were about in the same place where the turtles hatched in the movie and where Miley Cyrus and Liam Hemsworth sat watch over the nest. Anyway, as we sat and caught up from our college years, Dedra glanced at her watch and screeched, “Oh, its 6:30! We’ve got to get to the bar and hear Samuel play!” Not knowing Samuel, or having been in a bar in many years, it sounded like a good plan. Walking back toward Tybrisa Street and Bernie’s Oyster Bar, Dedra and I headed down an alley, entered an outdoor deck area through a wooden gate and there sat Samuel. Head of the Samuel Adams Band of Tybee Island. 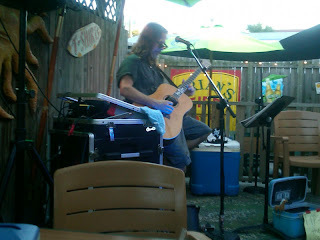 On a stool, under a beach umbrella and the most awesome music coming from his guitar and his ten fingers. Which sounded more like 20 fingers. Samuel Adams. Also known as the preacher of the Tybee Church. When he saw us enter and sit down, the smile on his face lit up the whole outdoor area and his eyes crinkled up like Santa Claus. I instantly felt like I had met a long lost friend and brother. That’s how Samuel is. As soon as a break came, he came over to our table, introduced himself and chatted for just a few minutes. As he started the next music set, Dedra and I ordered food and settled in for the evening. Somewhere during the next few hours, I suddenly realized that I was relaxing. The good music, meeting new people, the ocean breezes coming across the patio, all worked magic on me. During the evening, Dedra shared much about the work of Tybee Church in the community. Feeding people, sheltering people, clothing people, meeting the needs of the island residents. They baptize in the ocean, do weddings on the dunes, and sometimes have music and church during the week under the big pier. In other words, the church was all about the people…..and not the church. I did my college internship at a church in the inner-city of Atlanta. I learned about ministering to people who had been hurt by traditional churches in the past. People who were struggling just to exist. So, we worked to help meet their needs and placed no pressure on them to attend services; in fact, they had a weekday service just for the community folks who did not feel accepted on Sunday morning. Their clothes were not good enough or their hair wasn’t fixed just right…..or their language wasn’t the most appropriate. And this ministry worked. People came to know the Lord. I fell in love with this ministry and missed it when my time was up. The Tybee Church has the same heart and I felt like I had come home. They actively seek to love on people, regardless of their clothing, their hairstyles, their tattoos and piercings, their economic status…..or their language. People who need to be loved on. And hugged. And accepted. Many churches today say they accept and love, but when it comes right down to it, they don’t do so good. Tybee Church has it down. If I learned one thing from my visit there it was that I want to be more like that. I want to be an agent of God that is accepting of dirty hands and snotty noses….even if there is no hand sanitizer nearby. I’ll be going back to speak and worship at the Tybee Church soon, and as often as I can, because my heart is there. I lost it to those dear people who meet in a bar on Sunday mornings and do God’s work, simply and without a lot of theological words. Just love. 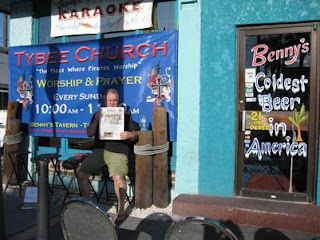 I recently wrote about going to Tybee Island and speaking in a church known as the Tybee Church, also known as the Bar Church, because they meet in Benny’s Tavern on Sunday mornings. Before I went, all I knew about the church was what I had seen on YouTube and what I had been told by a good friend from college who lives on Tybee and goes to the church. In fact, all I knew about Tybee Island was from reading Beverly Wittler’s columns about her love for the island community. Now I know why she feels this way. I arrived on the island mid-afternoon on a gorgeous Friday afternoon. I found my motel easily and spent the afternoon catching up with my friend, strolling the beach and the streets of Tybee. It was a different experience because before now I had only been to a beach town as a tourist, not a “local.” However, walking around with a local person kinda automatically put me in the same category and I began to meet the often unseen local residents of the island. Before long we ended up in front of Benny’s and Dedra took me inside to let me see where the church would be meeting. It was a bar. A dark, smoky, smelly beach town bar. My first thought was basically, “uh oh.” However, as my eyes adjusted to the light, I was being introduced to Betty. She was a lady I had seen just a few weeks earlier on the online church service being prayed for, hugged on, cried over and just loved all over because her daughter had just passed away. I could feel the love and care from that group of people all the way here in McDonough. However, as I sat at the bar (on a Friday afternoon this was a fully functioning bar….not a church) and listened to Betty tell part of her story and what the church and people meant to her, I felt a presence of God gently entering that corner of the bar. After seeing the stage area to the side where the bar bands play during the week and the church band plays and speaks on Sunday (often the same band), we left and I immediately saw an older man sitting on a bench watching traffic and the people passing by. Naturally, Dedra knew him (she knows everybody between Savannah and Jacksonville, I believe), and she introduced me to Bob. We sat with him for a bit and, again, I heard a lot of his life story. The most miraculous thing that has stuck with me day and night since then is that he is thirty-years sober. He, too, is a regular at the Tybee Bar Church and shared the following with me. “I like to go early on Sunday morning when the guys start to transform part of the bar into a church. I did a lot of sinning in this place during my life, and others still do every day, and it is my time of healing to see this place of sin become a place of God. It’s what keeps me strong,” shared Bob. Well, I am out of space, and you haven’t even met the preacher, so I’ll just have to continue this another time. But, let me just say one thing. Folks, my life changed at Tybee Church. They stole my heart, as I have said. I met people who love those who are often unloved; people who have such a simple childlike love for God (a good thing) and love to come together once a week; people who love and take care of each other and their community. That’s what church is.